All pictures can be clicked to enlarge or right click to open link in new window. Sirsa is twice lucky and not shy in sports anymore. 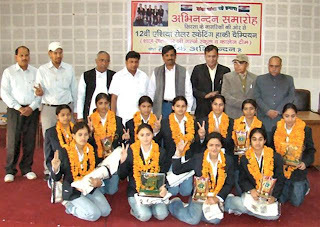 After Sardar Singh’s feat at Asian Men’s Hockey Cup, lady luck has stricken again, more than half a dozen of Sirsa Girls brought laurels to SIRSA once again by making the Indian team win the 12th Asian Women’s Roller Skating Hockey Champion Ship held at Kolkata recently. These players were welcomed by citizens and were honored by the district administration at program held at Panchayat Bhawan presided over by the Deputy Commissioner Sirsa, Mr. V Umashankar. 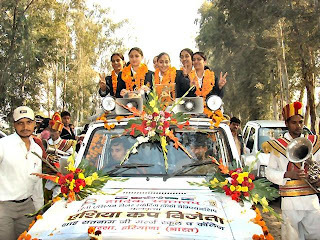 The girls, who are students of Shah Satnam Ji Girls Education School, are captain Sandeep, Puja, Sonali, Yashdeep, Milan, Mira, Gurpreet and Sabdeep. The best scorer award of the tournament was bagged jointly by Sandeep and Yashdeep, while the best player award was won by Yashdeep. The championship was held in Kolkata from November 28th to December 2nd. Mr. V. Umashankar who takes keen interest in promotion of sportspersons said that while Sardar Singh has been awarded cash prize of Rs. 10 lakh, which has been now duly sanctioned by the State Government, the names of these Girls shall also be recommended to the State Government.